Here's a look from last week that I forgot to post, right before I switched up my hair. 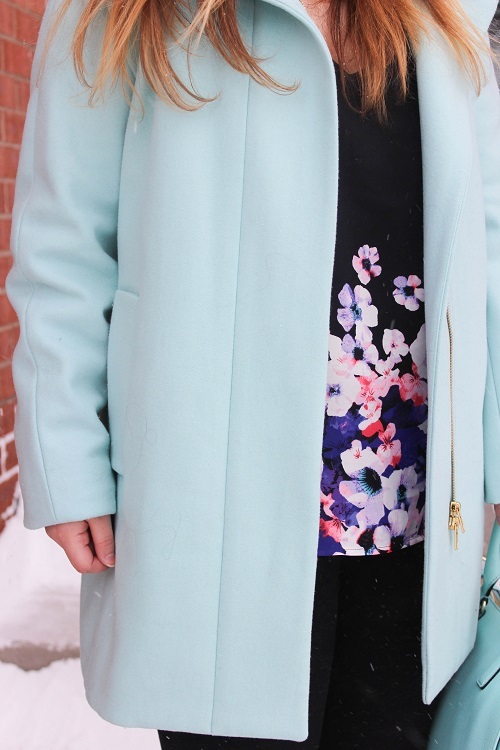 Normally, I wouldn't even attempt to take photos while it's snowing but I thought the snow would be a nice contrast against the mint blue coat previously seen here. It's quite obvious that these photos didn't turn out that great but hey it's the look that counts right? I'm pretty sure I'm never going to attempt to take photos in this weather ever again though haha. I wore this look to a class presentation (which I absolutely hate! Who else gets super nervous?) and lately I've been having so many that it's getting hard to even put an outfit together for it that's not boring. There's nothing fun about business clothes and it kills me that I have to dress like this if I'm going to be working in an office for the rest of my life. 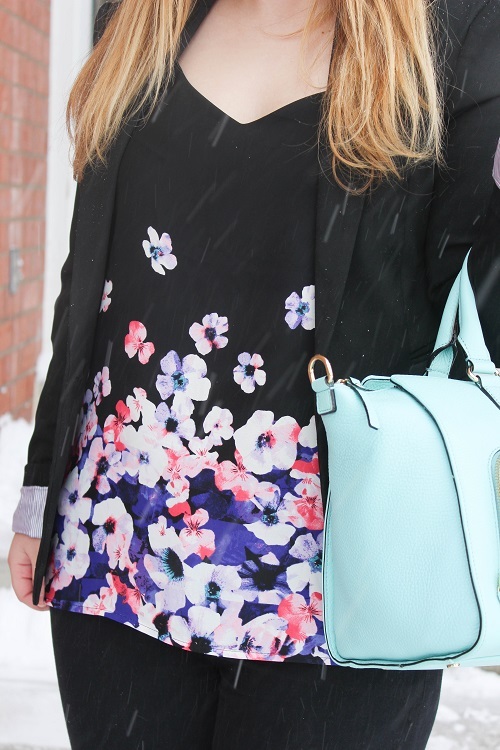 I tried to add some pops of color to this all-black outfit with the mint coat and bag along with the floral pattern on the blouse. Can you tell how much I want it to be spring already? By the way, since I haven't found the perfect pair of black business pants, I'll usually wear black skinny jeans since it gives off the same illusion. I've seen so many girls do this for presentations and it just works if you need something last minute. What do you wear for class presentations? Do you hate business clothes as much as I do? Let me know! I loved this outfit! 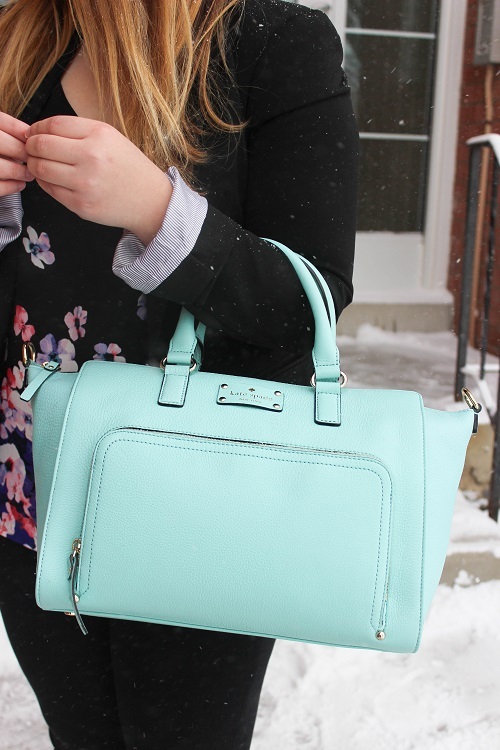 I love how to added a pop of color with the mint handbag and coat. Everything blends in so way! And it's not the average winter outfit. Gorgeous! I love the color of your coat and a bag! First of all, it's a perfect match. Second of all, each of the pieces is so gorgeous! I truly love this spring-y look!